It’s never too soon to get started on a lifetime of outstanding oral health. As a parent, you have plenty of things to worry about as your child grows and learns, but don’t forget about helping them build great dental hygiene habits. 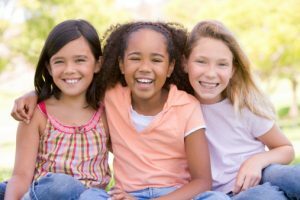 The team at Aesthetic & Family Dentistry of Washington is always happy to help kids improve their oral health, but a beautiful smile starts with caring for teeth properly at home. Even before your child’s teeth develop, you should keep gum tissue clean and free from bacteria. Use a damp cloth to remove film and bacteria left over after feeding. We know it’s tempting, but don’t allow infants to fall asleep with a bottle of formula or milk especially once teeth begin to develop. The sugar sitting in the mouth can be detrimental to developing teeth. Once your child has even one tooth, you should begin brushing with a soft bristled, infant toothbrush. You can use a tiny amount of toothpaste (about the size of a grain of rice), or just water. As soon as your child has two teeth that touch, you should begin flossing. Just like you, your child will benefit from twice annual dental appointments starting around the age of 3 when most toddlers have a nearly full set of primary teeth. If you notice dental health concerns before that time, please don’t hesitate to schedule an appointment. Teaching Kids to Brush & Floss Made Easy and Fun! Choose the right equipment –Whenever possible, let your child make guided toothbrush, toothpaste, and floss choices. This makes them look forward to brushing and flossing time. It takes two – Proper brushing comes down to 2 minutes of brushing 2 times a day. Help your children keep track of the amount of time they spend brushing by playing a song, setting a timer, encouraging them to brush every single tooth, or even using a mouth rinse or discoloring tab that shows your child where they need to brush. Fabulous flossing – Flossing is a daily activity that many adults still dread, but it is one of the greatest gifts you can give your smile. Choose a gentle glide floss and help your child learn to hold the floss properly and clean between each tooth. There are also many kid-friendly flossers available. My turn Your Turn – For your littlest smiles, you may need to play a game of my turn your turn. This is an imitation game where you’ll brush a few of your child’s teeth, then he will imitate you on the next. The same works for flossing. Alligator teeth – Getting kids to open wide during at-home hygiene might be easier than you think. Just play alligator teeth! Have your child pretend to be an alligator who wants to show you all of his teeth, so he has to open his mouth extra wide. Alternative versions of the game are lion teeth, dinosaur teeth, shark teeth, etc. Choose a toothy animal your child enjoys. If you or your child are ready for a checkup, teeth cleaning, or any of our other comprehensive dental services, please don’t hesitate to contact the friendly, skilled professionals at Aesthetic & Family Dentistry of Washington. We can’t wait to see you smile.